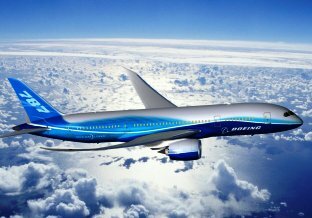 Rajeev's World: The Dreamliner Comes Calling! Hey, I am not talking about our car, which we had nicknamed the Dreamliner! I am talking about Boeing's new airliner, the 787 Dreamliner, which is touted to be the world's first major airliner to use composite materials for most of its construction. The Dreamliner came calling here in India at New Delhi's T3, in the colours of ANA - All Nippon Airways, which is supposed to be the launch customer of the 787. The moment we all waited for was here - the Dreamliner was welcomed by the classic water cannon shower, a tradition which is religiously followed in commercial aviation! The Dreamliner represents the newer philosophy in air travel that bigger is not necessarily better. Dwindling orders for the ultra large long haul carriers forced Boeing to look at newer cost efficient fuselages. The airline business suffered a setback after the New York attacks of September 2001, which further reduced the appetite for large capacity aircraft and airlines the world over started focusing on shedding weight. But at the same time, when EADS controlled Airbus Industie was already in the midst of developing the Airbus A380. the crisis in the aviation industry struck, they chose to hedge their strategies with the development of the A350. It remains to be seen as how the competition in this segment shapes up as the A350 is still being developed. The 787 Dreamliner is expected to join the ANA fleet by September or October this year. It is also expected to join Air India's fleet by the end of this calendar year, the second airline to have them. Air India's first two 787s are at advanced stages of completion at Boeing's Everett facilities and photographs of these jets in Air India's stylish livery have found their way on the internet - Flight Global's blogs actually carry the pictures of the first Air India 787, which has been registered as VT-ANA - any connection with ANA, I wonder. Jet Airways is also expected to induct the 787 Dreamliner sometime thereafter. The 787 Dreamliner promises to be a different experience. The engineering and design of the 787 Dreamliners is kind of unconventional - the aircraft uses composite materials in fabrication of the fuselage, making way for lower fuel consumption by as much as 20%. The aircraft has a four-panel windshield, the engine nacelles are serrated to reduce noise (something that the Boeing 747-8i also features these) and an unconventional smoother nose contour. The nose contour is something that is something not easy to get used to, but slowly grows over you! The interior mock-ups have built up a lot of excitement on what the final product would have - larger windows, LED mood lighting etc. There is a lot of excitement that has been built up around the 787 Dreamliner as it does its rounds of demonstration flights around the globe. And it touched down at Delhi from Tokyo's Narita. It was scheduled to fly in to Bombay from Delhi, and I was hoping to catch a glimpse of the new beauty here. But sadly, the 787 Dreamliner flew back to Seattle directly from Delhi, as Bombay faced a high security alert following terror attacks. My wait for the 787 Dreamliner seems to be a bit longer and hope I get to fly on them soon!